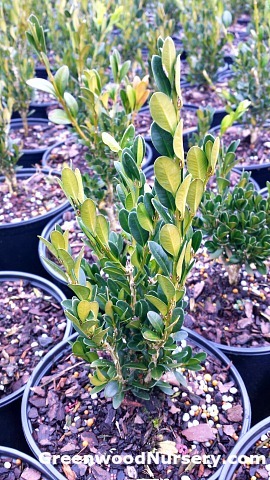 Green Mountain is the choice boxwood shrub to create a beautiful hedge. This taller growing evergreen plant reaches 5 feet tall with a spread of up to 3 feet wide. The Buxus sempervirens 'Green Mountain is commonly used for hedges, knot gardens, container plants, and backdrops for bright perennial plants. Green Mountain Boxwood is grown in a one gallon container. Note: The image of plant is a one gallon. Top growth will often vary according to time of year when a crop is released for shipping. Orders shipping to CA or AZ will be bare rooted and root washed before being prepped for shipping.